1 OWNER VEHICLE, BACK UP CAMERA, BLUETOOTH, TIRE PRESSURE MONITOR, ALLOY WHEELS Black Cloth. CARFAX One-Owner. 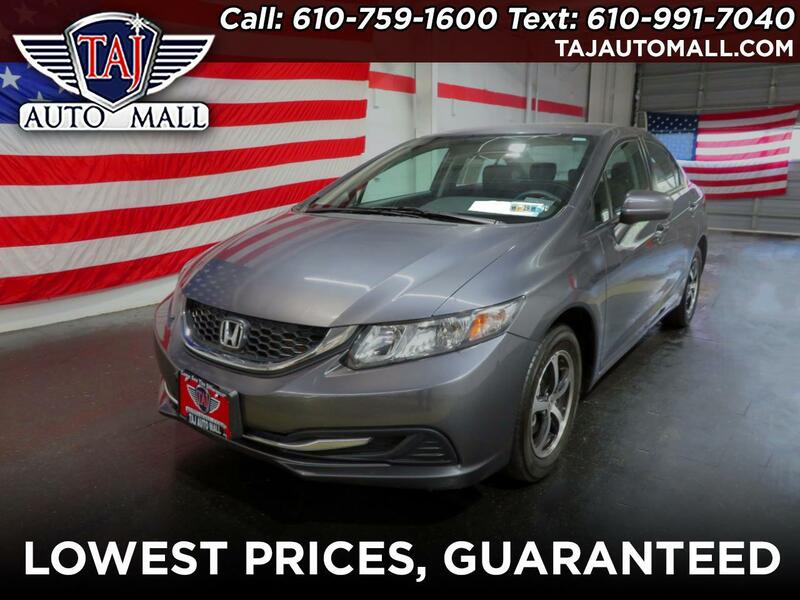 Gray 2015 Honda Civic SE FWD 1.8L I4 SOHC 16V i-VTEC Recent Arrival! Odometer is 8112 miles below market average! 39/30 Highway/City MPG** Awards: * 2015 IIHS Top Safety Pick * 2015 KBB.com 10 Best UberX Candidates * 2015 KBB.com 10 Best Sedans Under $25,000 * 2015 KBB.com 10 Tech-Savviest Cars Under $20,000 * 2015 KBB.com Best Buy Awards * 2015 KBB.com 10 Most Affordable Cars * 2015 KBB.com 15 Best Family Cars * 2015 KBB.com Brand Image Awards 2016 Kelley Blue Book Brand Image Awards are based on the Brand Watch(tm) study from Kelley Blue Book Market Intelligence. Award calculated among non-luxury shoppers. For more information, visit www.kbb.com. Kelley Blue Book is a registered trademark of Kelley Blue Book Co., Inc. Reviews: * For 2015, the Honda Civic remains the act to beat, thanks to its strong reliability, safety, comfort and resale value. Whether you're looking for a practical sedan, a sporty coupe, a frugal hybrid, or an ultra-clean compressed natural gas (CNG) model, there is a Civic to meet almost any demand. Source: KBB.com Taj Auto Mall has over 1,500 affordable vehicles in stock. Our dealership specializes in providing you with the best used cars, trucks, and SUVs in the Allentown, Pennsylvania area. Part of our promise to you is that we will always strive to provide you with unbeatable service. Our goal is to go above and beyond your expectations. Our Bethlehem dealership has tons of well-equipped SUVs, trucks, and cars at highly affordable prices. Recent Arrival! So come on down to our dealership in Bethlehem, Pennsylvania. We are open Monday through Saturday from 9 am to 8 pm. Contact us with any used car questions you may have, our number is 610-759-1600. Make Taj Auto Mall your first choice for affordable used vehicles.